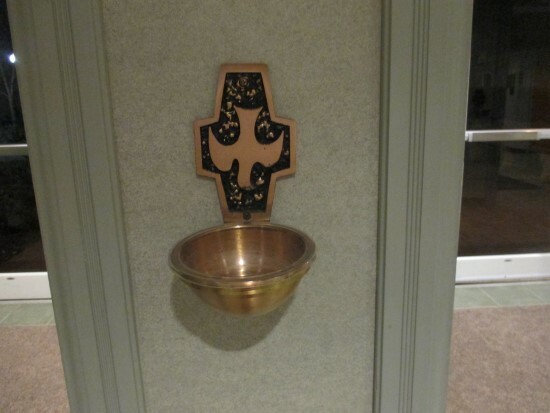 As we enter the Outer Doors of the church, the first thing we see is the Stoup, or Holy Water Font, a container for holy water placed at the doors of the church. 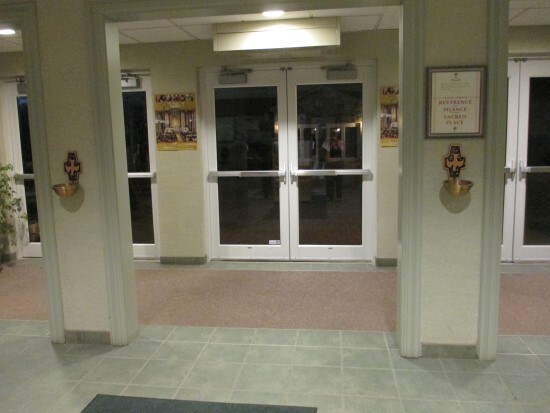 Parishioners use the water to bless themselves as they enter and leave the church. 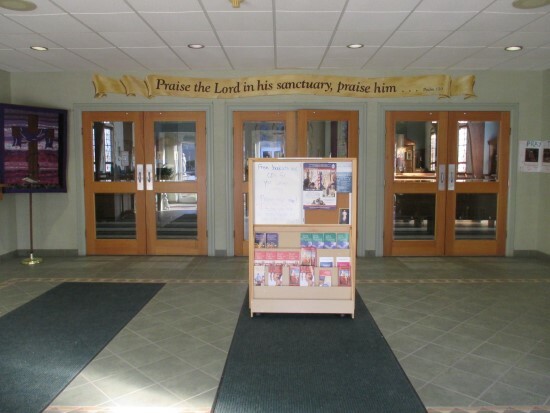 The Narthex or gathering space (also called the vestibule or lobby) is the point of entry into the Church. 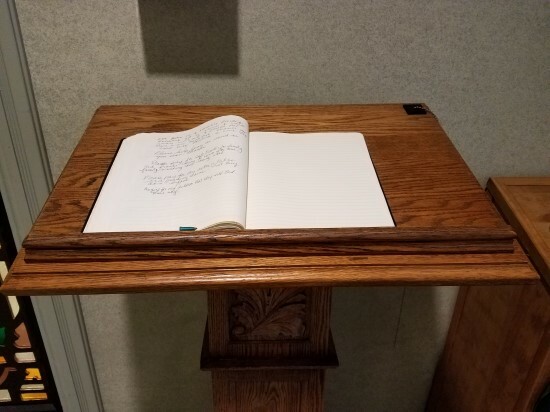 Included in the Narthex is the Book of Prayers for entering names of people to be remembered in prayers. 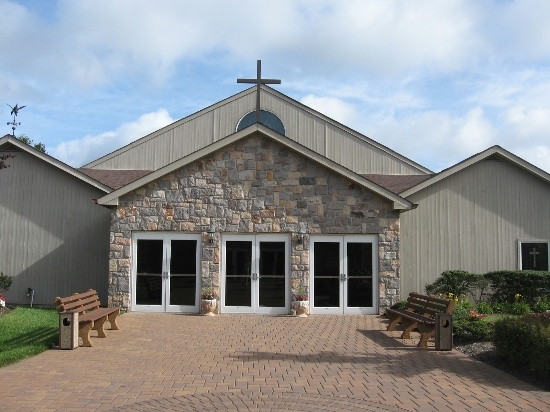 The Narthex is also the place where various donations (food, clothing, Christmas gifts, etc.) are gathered before being sorted and dispersed to the needy of our parish and surrounding communities. Once through the inner doors, we enter the Nave of the Church. 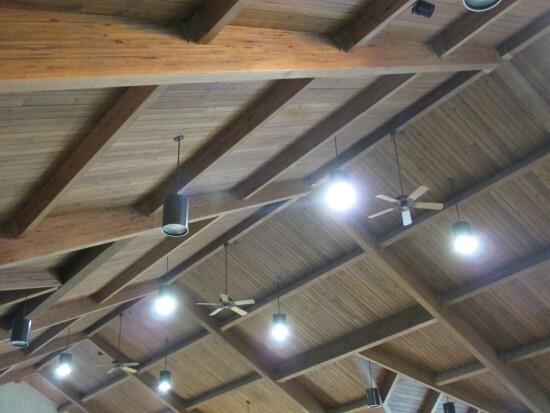 Have you ever noticed the ceiling? It looks like the bottom of Noah’s Ark. 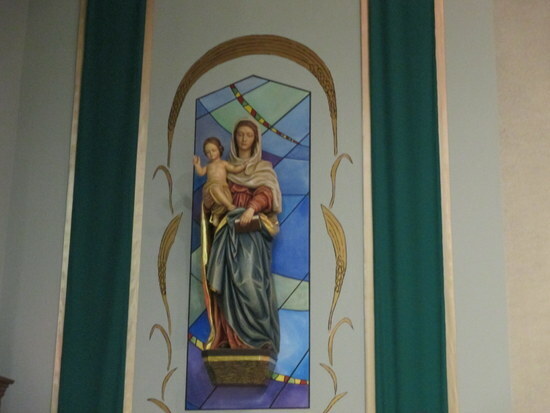 Over the doors where you enter the nave of the church is a painting of St. Catherine with the Holy Spirit Window above her. At four locations in the church are small Candles that are used for special occasions such as when the Bishop says Mass. 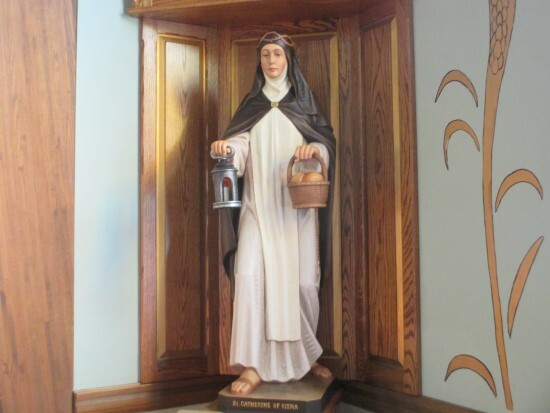 These candles were also lit when St. Catherine’s finished paying off the mortgage in late 2014. 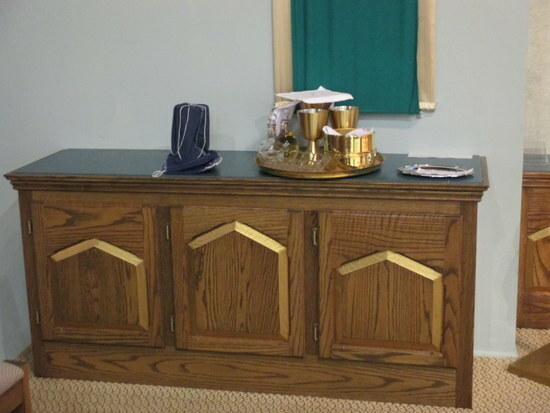 Along the back wall of the church is the Ambry or Oil Cabinet containing the oils used for the sacraments of Baptism, Confirmation, and Anointing of the Sick. 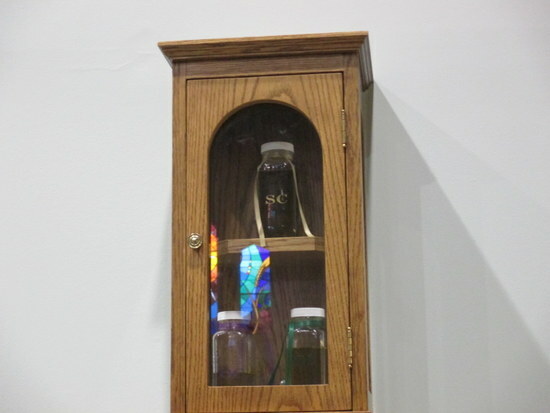 Each year, at the Chrism Mass that is celebrated during Holy Week, the oils in this cabinet are exchanged for new oils and the unused old oils are disposed of via a sacrarium. The Confessional, a room where the sacrament of Reconciliation takes place, is in the corner along the same wall as the Ambry. 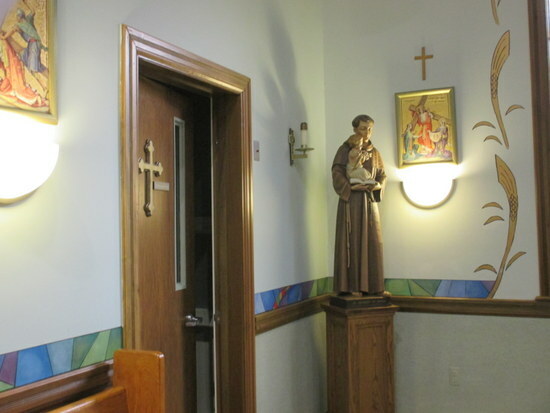 At St. Catherine’s the Sacrament of Confession, also referred to as Penance or Reconciliation is offered every Saturday from 3;30 – 4:00 pm and at various special times during the year. There is a direct line from the inner doors to the altar and a cross line called the transept across the middle of the Church. 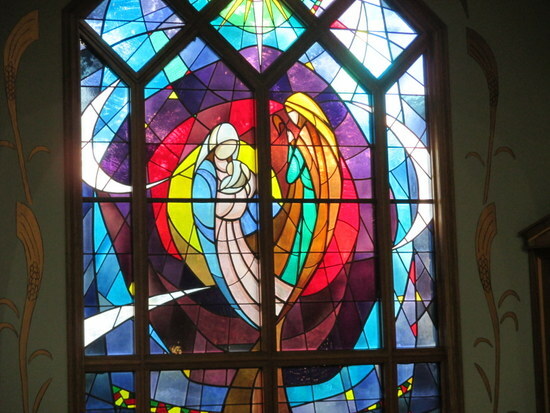 On the left side of the transept is the Nativity Window including the Holy Family in the shape of a heart and the Star of Bethlehem shining down on them. 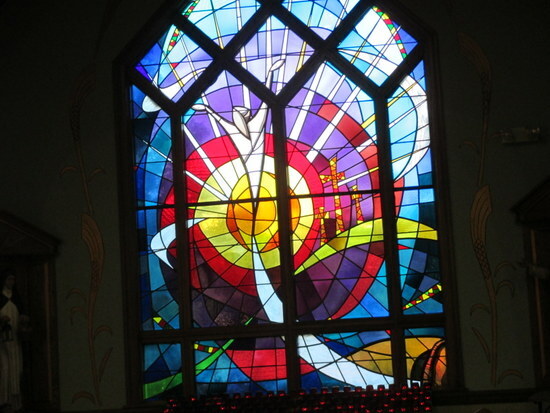 On the right side is the Resurrection Window. See the tomb in the lower right hand corner? See the hand reaching down to the resurrected Christ? If you look closely, the windows are moved slightly further out than the rest of the side walls. In some churches this is even more pronounced. The effect from above is that of a cross. Under the Nativity Window and the Resurrection Window are banks of Votive Candles. A votive candle or prayer candle is a small candle intended to be burnt as a votive offering in an act of Christian prayer. 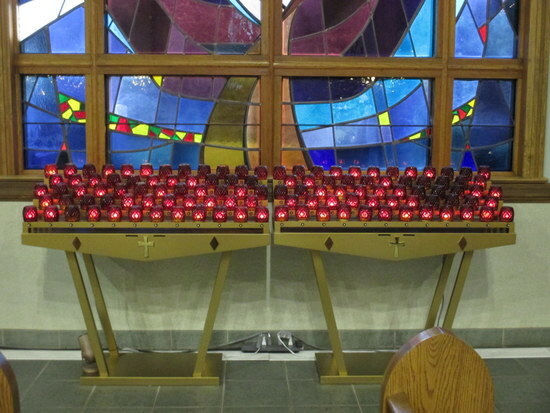 At St. Catherine of Siena Parish, these candles are electric rather than wax. Moving up the center aisle of the church, we come to the Baptistry or Baptismal Font where new Catholics receive their first Sacrament. 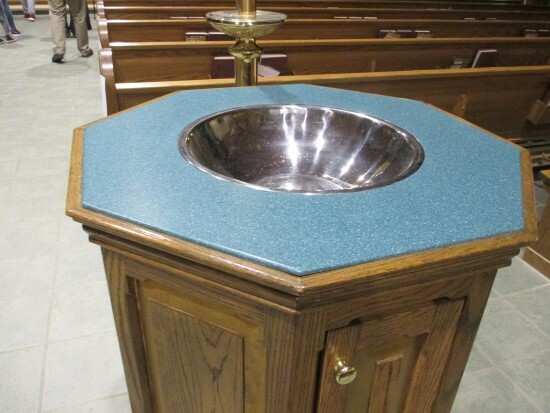 This font can be a basin and/or pool containing blessed water in which new members of the church are baptized. The water in the font may be moving, representing the “living water” by which people are reborn into the faith. 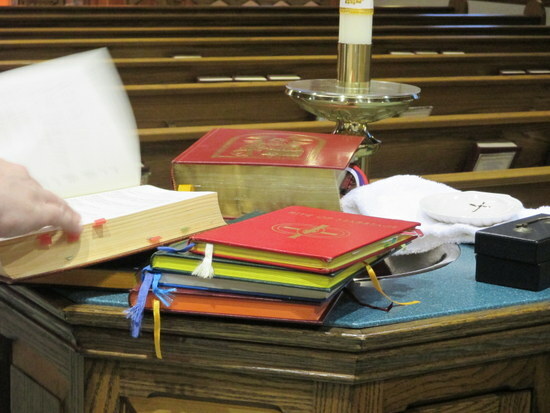 Pictured here are some of the books that are used for rituals such as Baptisms, Confirmations, Marriages, Anointing of the Sick, Funerals, etc. 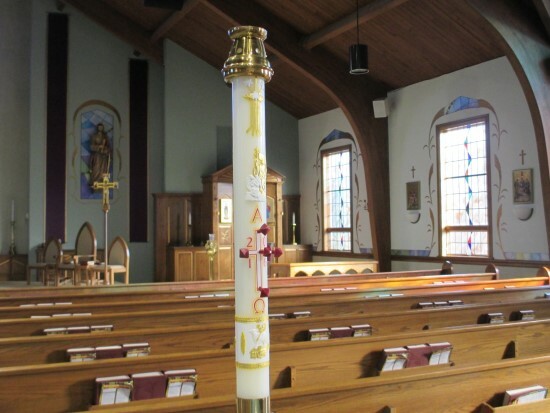 The Paschal Candle is a large wax candle that is blessed on Holy Saturday during the Easter Vigil. 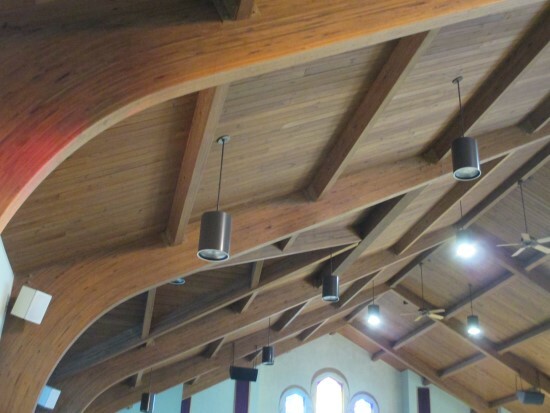 Representing the light of Christ, it is lit for baptisms and funerals. 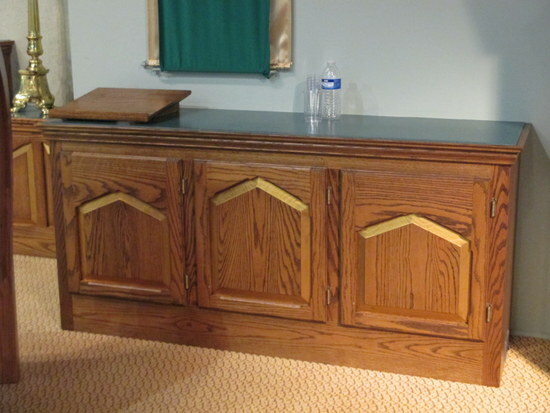 A small shelf by the Baptismal Font is where the Gifts, the wine and the unconsecrated hosts, are located until they are brought to the altar for the consecration. 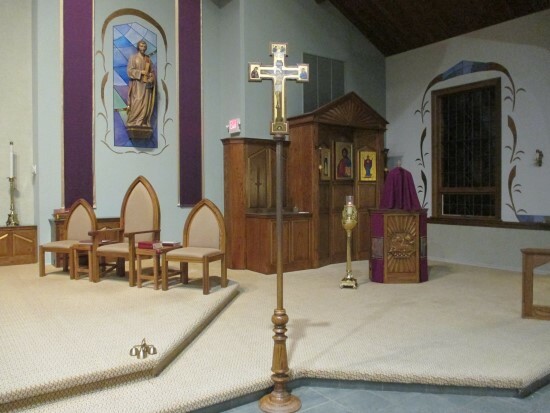 At the front of the church is the Sanctuary, containing the Altar, Crucifix, Ambo, Presider’s Chair, Credence Tables, Censer, Tabernacle, and the Sanctuary Lamp. 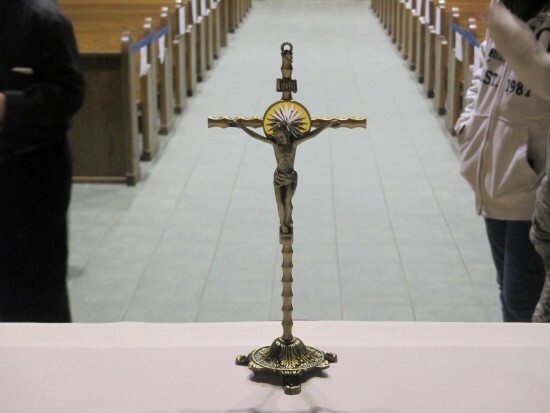 A Crucifix is a cross with the figure of the crucified Christ on it. 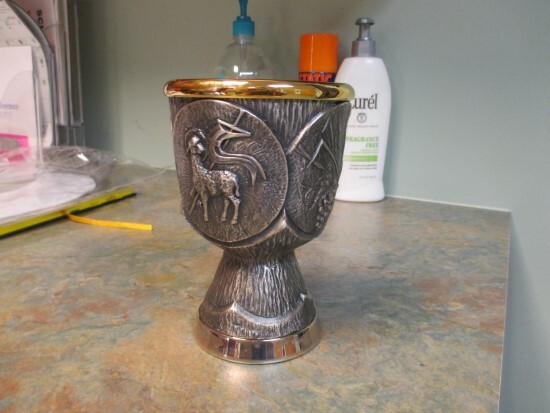 Its purpose is to remind us of the passion, death and resurrection of Jesus Christ. 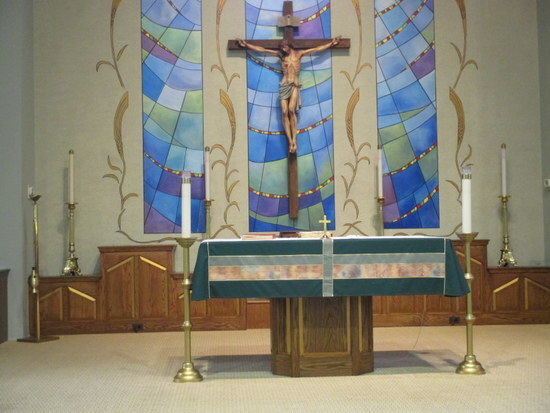 There is a large Crucifix on the wall behind the altar for the people to see and a small crucifix on the altar itself facing the priest for him to see. 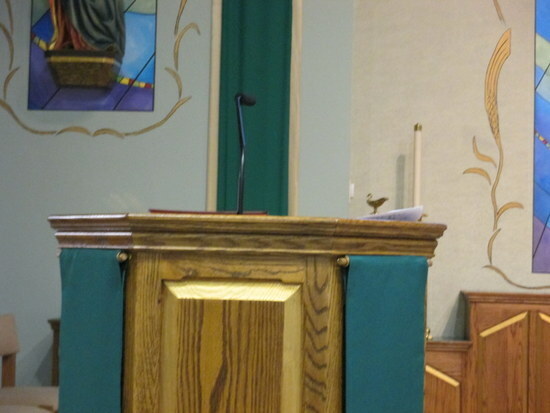 The Ambo is the podium or lectern from which the readings are proclaimed. It takes its name from a word meaning “elevated,” and is based on the raised platforms from which rabbis read. 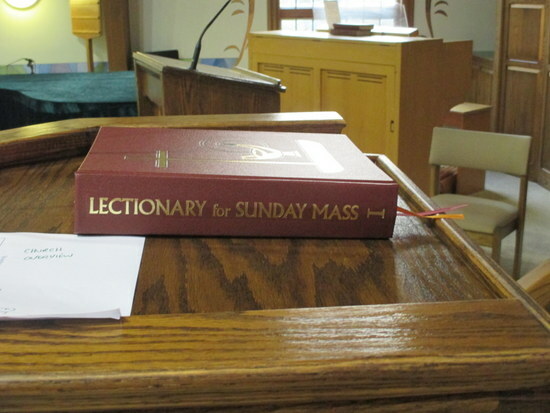 The Lectionary is the book that contains all the readings for Mass and is the book that the readers use during the Liturgy of the Word. The Presider’s Chair is the chair for the priest during the mass. If there is a Deacon at that Mass, he sits to the right of the priest and if there is an altar server, he or she sits on the priest’s left. 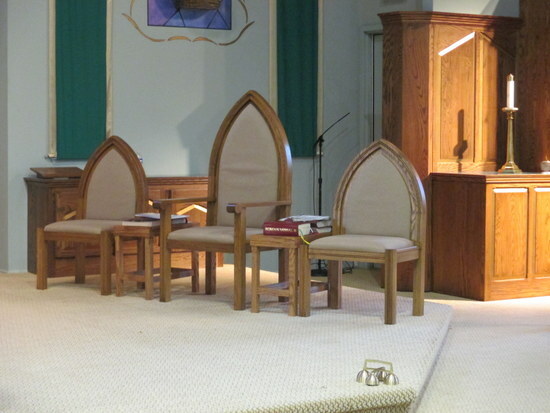 The Presider’s Chair at St. Catherine’s is now placed behind the altar rather than to the side. This altar server carries the Processional Cross in front of the priest and deacon as they walk up the center aisle to begin mass. 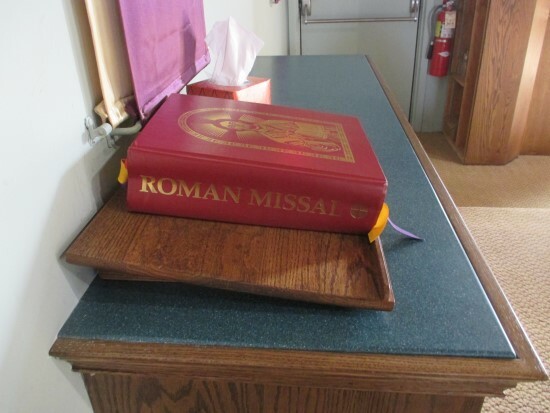 He or she also holds the small Roman Missal the priest reads from as he stands in front of the Presider’s Chair. 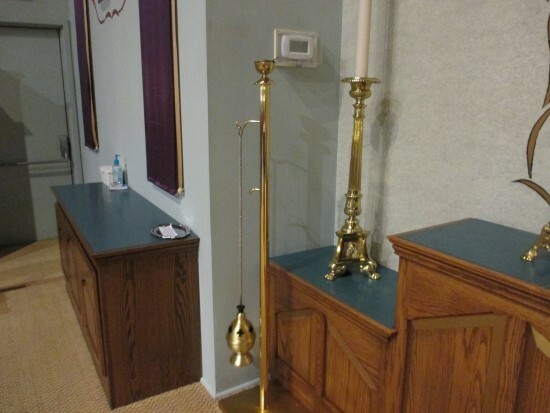 If there is more than one altar server, the others sit on the other side of the altar, behind the ambo. 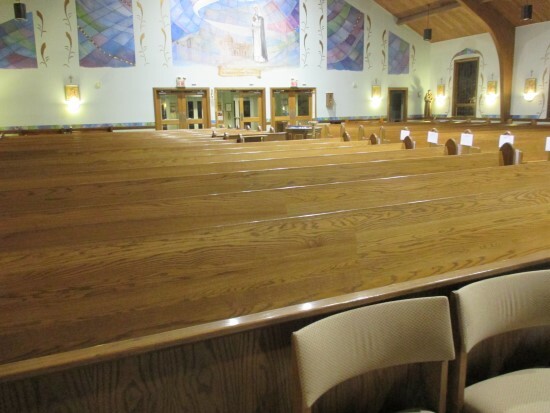 The Credence Tables are located along the back wall of the Sanctuary. 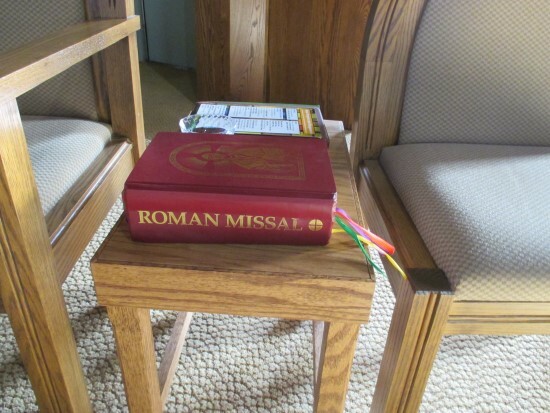 The one on the right holds bottles of water and is the place where the stand with the priest’s larger copy of the Roman Missal rests when it is not on the altar. 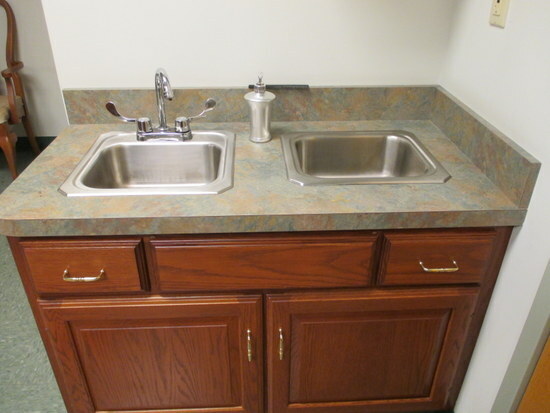 To the right of this Credence Table is a small container of water and a Purificator where a dropped host can be dissolved or a minister can wash their fingers. 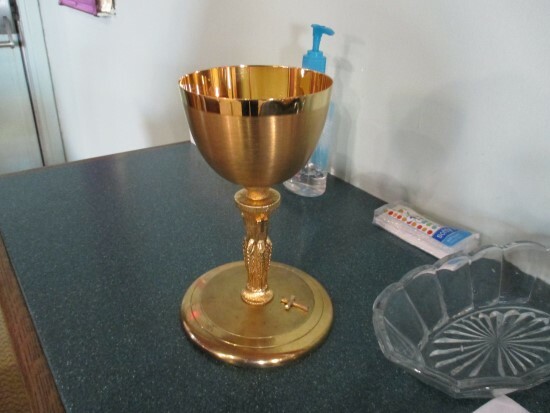 ​The Credence Table to the left as you face the altar is the place where the chalice, ciboria, unconsecrated hosts, water, wine and the various cloths used during the mass are located. The Censer or Thurible is the metal container in which incense is burned. The fragrant smoke that rises symbolizes our prayer rising to God. 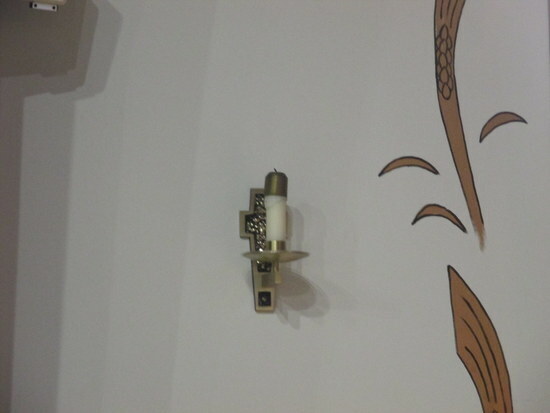 Incense is used on special occasions such as Adoration of the Blessed Sacrament and funerals. 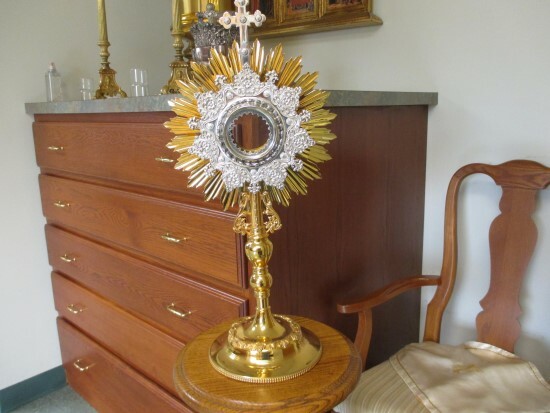 A Monstrance holds a consecrated host when Adoration is being held. 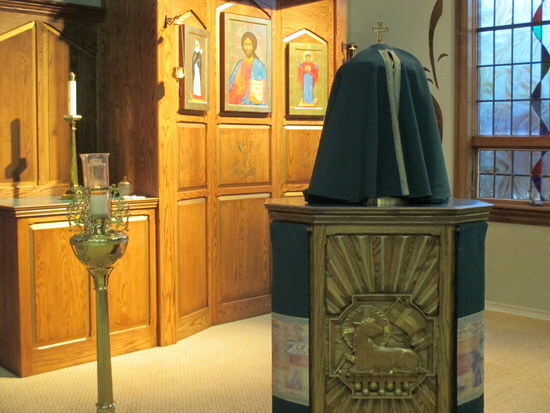 The Tabernacle is a boxlike repository for the Blessed Sacrament – the consecrated hosts of Christ’s actual presence – displayed in a prominent place near the main altar at St. Catherine’s or in a separate chapel at some other churches. 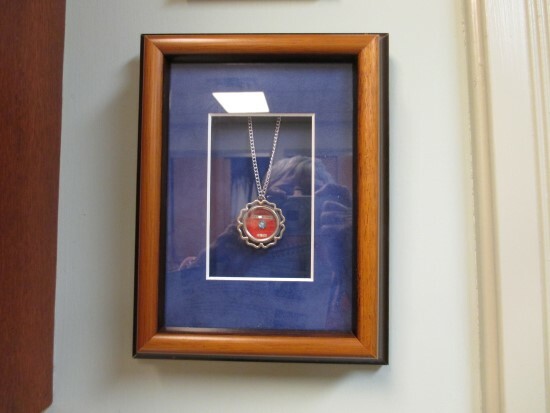 The Sanctuary Lamp is a light, normally a burning candle, contained within red glass that is placed before the tabernacle where the Blessed Sacrament is kept. 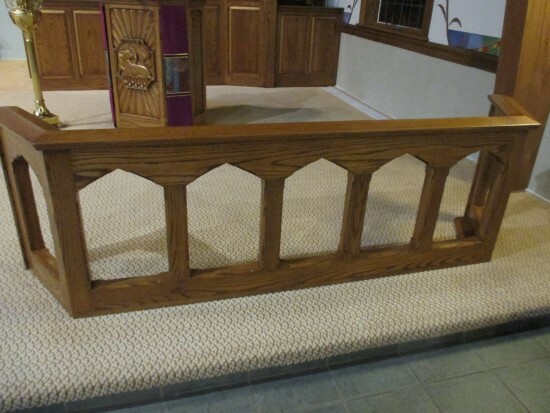 The Altar Rail is where the Ministers of Holy Communion kneel during the consecration. 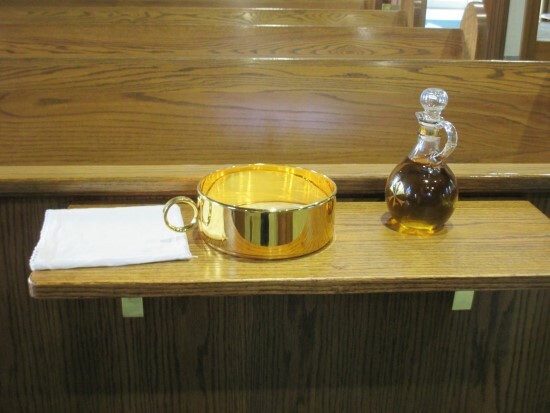 It is at the edge of the altar on the right side as you sit in church. 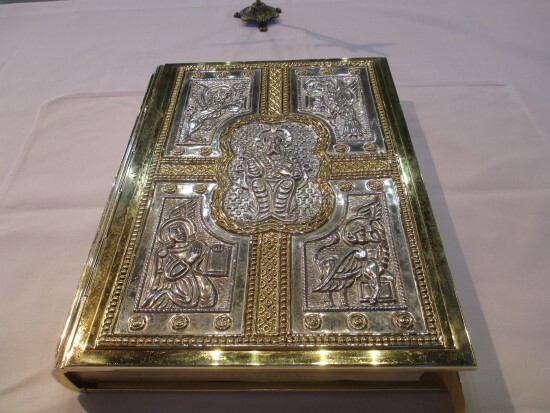 There are two copies of the Book of the Gospels used at mass. 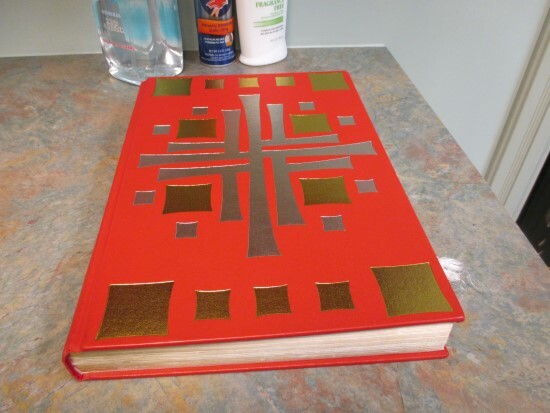 The red book is the one used in ordinary time. 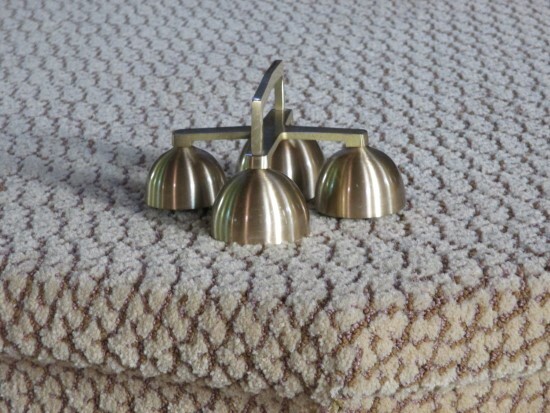 The one with the metallic cover is used for special occasions such as Christmas and Easter. If you have ever lifted the one with the metallic cover, you know how heavy that copy is! The Bells are rung at the consecration. 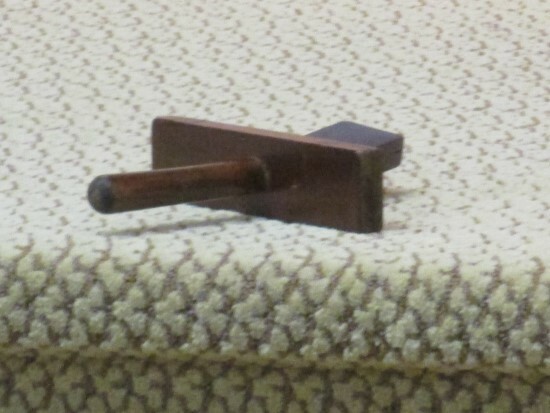 At a certain point in Holy Week, the week before Easter, the bells are replaced by a Wooden Clapper. 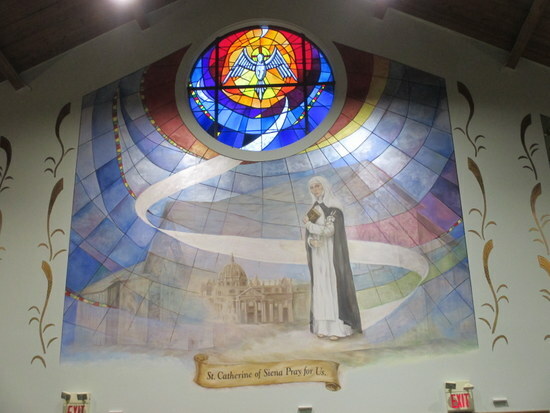 St. Catherine of Siena. The faithful do not worship statues, they serve only as a reminder and source of inspiration. 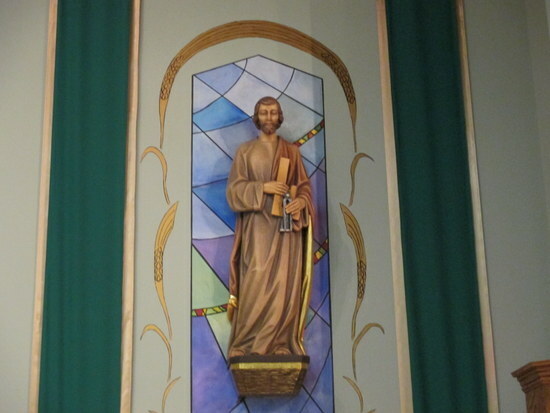 The banners on each site of the statues on the altar indicate the liturgical color for that mass. Green is for Ordinary Time, Violet for Lent and Advent, White/Red for the Triduum, and White for the Easter Season and Christmas. 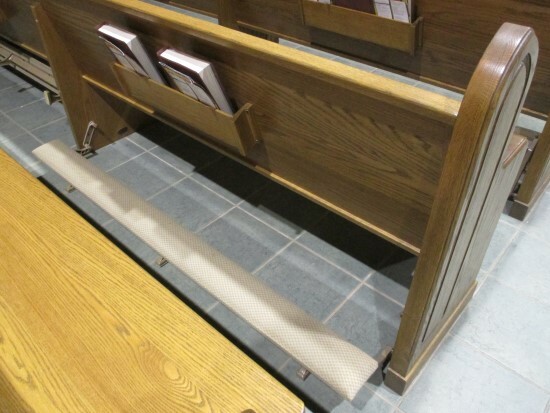 Kneelers are in front of the pews and can be put down for kneeling. 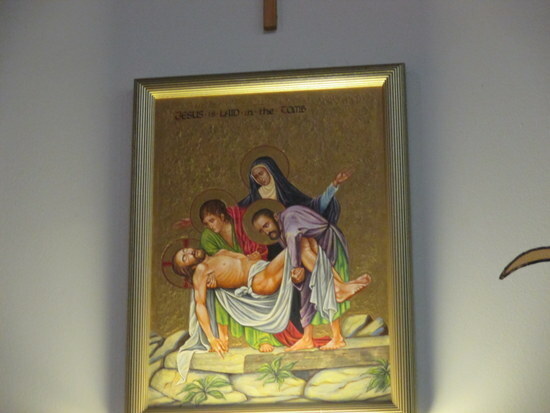 The Stations of the Cross are a series of pictures, paintings or engravings on the wall of a church depicting the passion of Christ (the events leading to his death). The faithful use them as aids in prayer. 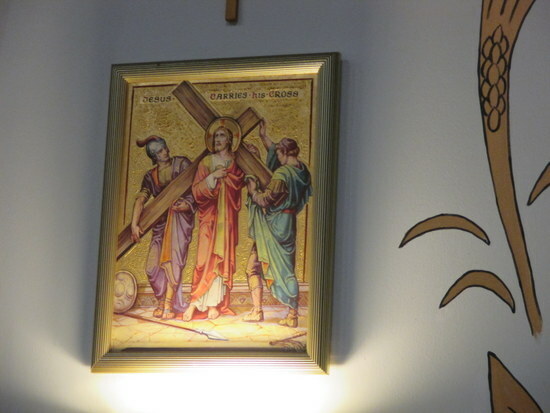 At St. Catherine’s, we say the Stations of the Cross in the Church every Friday evening during Lent. As you leave the nave of the church after mass, you pass the doors to the Sacristy, where the priest and deacons prepare for mass. 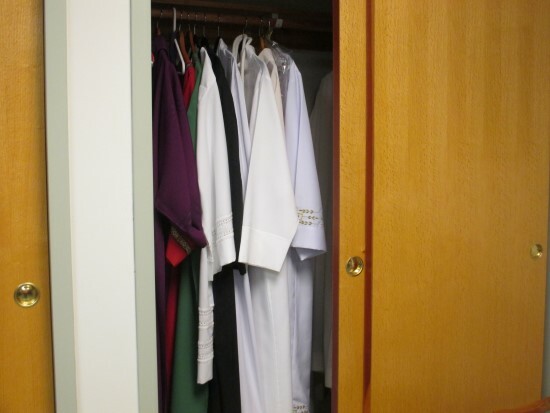 The Vestments for the priest and deacon are in the Vestments Closet. 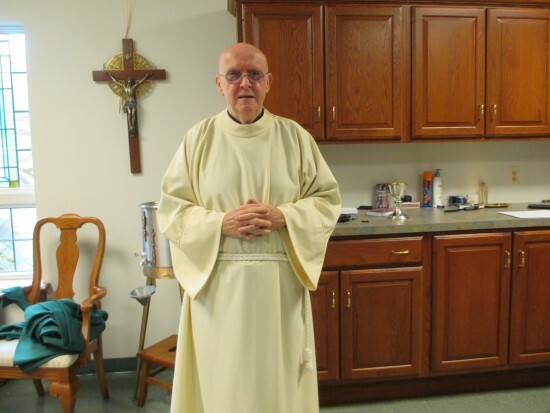 Father Al Burke models an Alb, the garment worn under his other vestments.The Alb is blessed before being worn. 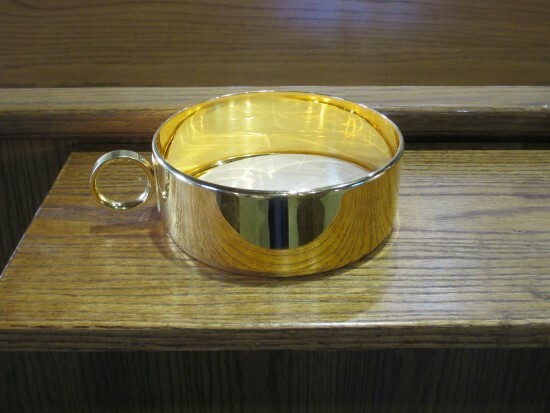 It symbolizes the garment in which Christ was clothed by Herod and the purity of the soul with which the Sacrifice of the Mass should be offered. The Alb is secured with a Cincture. The Cincture is a cord and tassel tied around the waist of the Alb and signifies chastity. 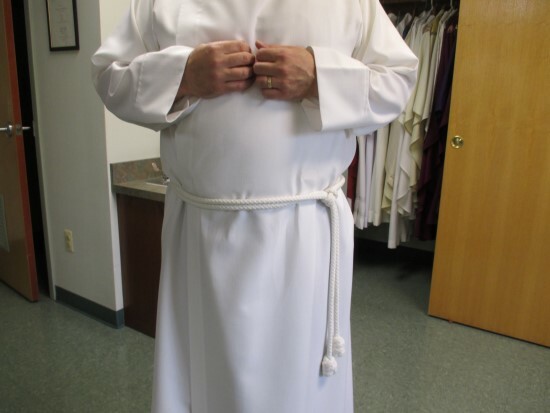 After donning the Alb and Cincture, the priest puts on a Stole. 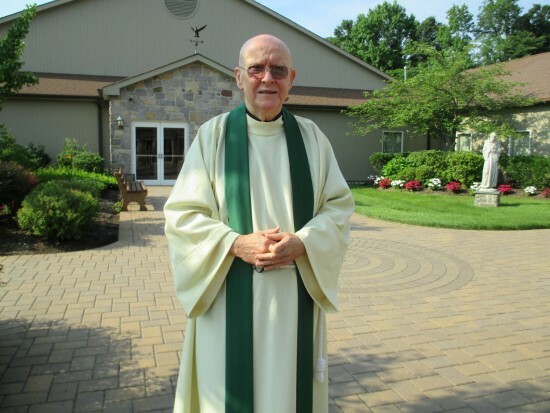 A stole is worn around the neck by priests and bishops and at the left shoulder like a sash by deacons for the celebration of Mass, administration of the sacraments, and ceremonies of the Blessed Sacrament. 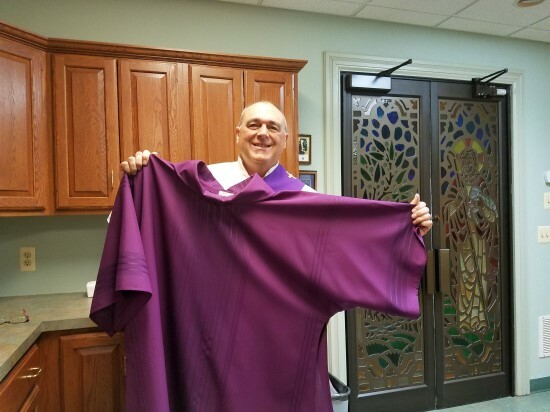 Finally, the priest adds a Chasuble in the appropriate liturgical color for that mass. 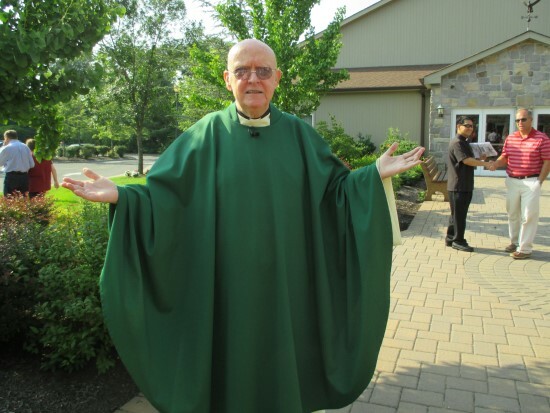 A Chasuble doesn’t have sleeves. 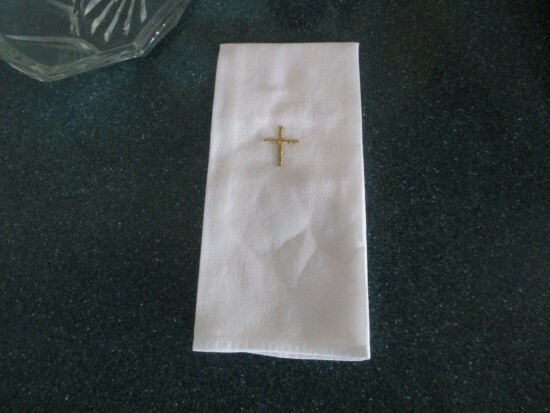 Deacons also wear stoles, but for the deacon, the stole is worn at the left shoulder like a sash. 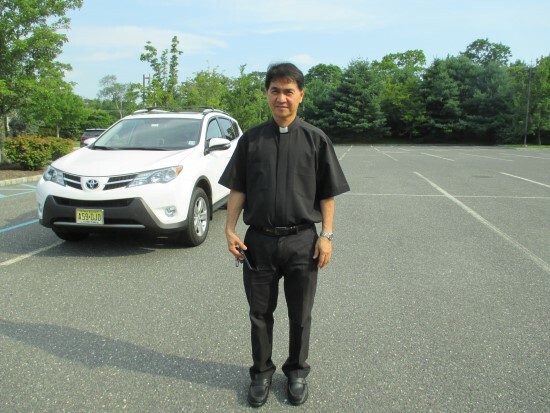 There is another difference in the vestments for priests and for deacons. 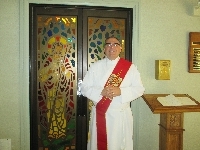 Deacon Dan displays a Dalmatic, which has sleeves and is open on the sides. It is the same material and color as the chasuble worn by the priest that day. 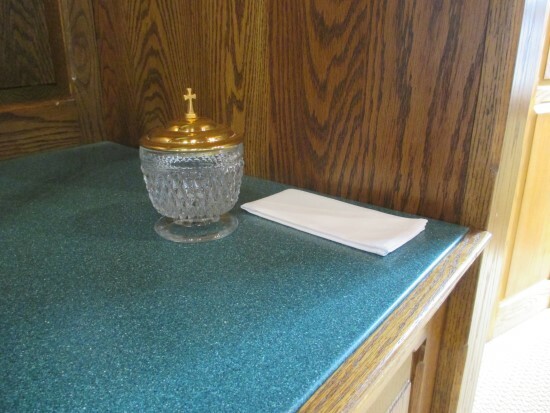 The Sacrarium in the Sacristy is a special sink that drains directly into the ground. Sacraria are used for a variety of purposes, including the disposal of ashes from objects that have been blessed and then destroyed by fire, to dispose of the water that has been used to wash the altar linens, to dispose of water that has been used to dissolve small particles of the host, and to dispose of water that has been used to clean up places where the Precious Blood has spilled. 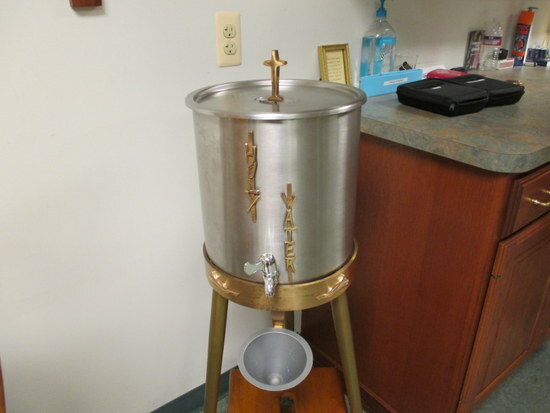 Also in the Sacristy is the container for Holy Water. 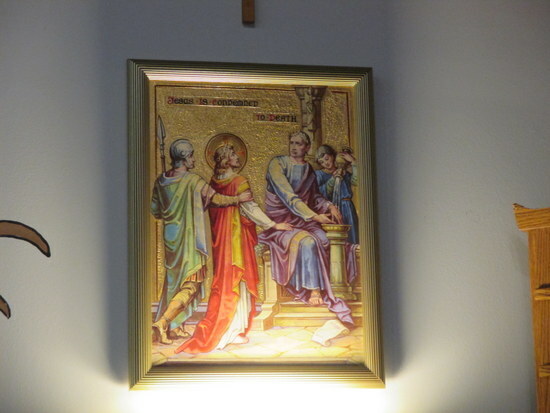 Relics of Saint Catherine are on the wall just inside the Sacristry doors. 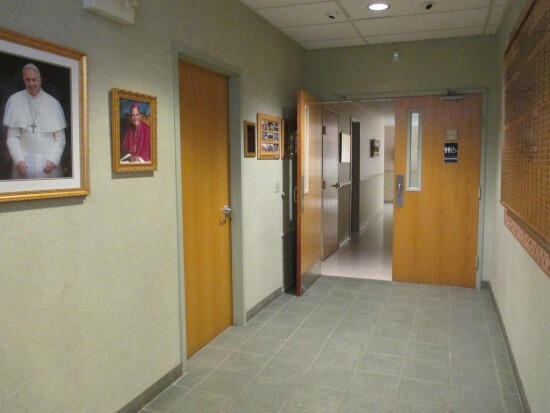 Across from the Sacristy is the Hallway that leads to the restrooms and a conference room. 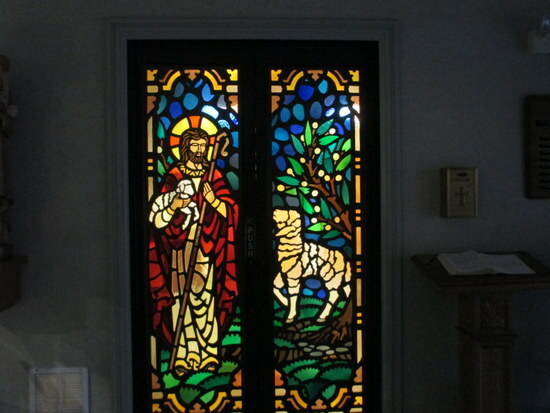 As we pass through the Narthex on our way out of church, we are to go in peace to love and serve the Lord.